Finish It February is underway. 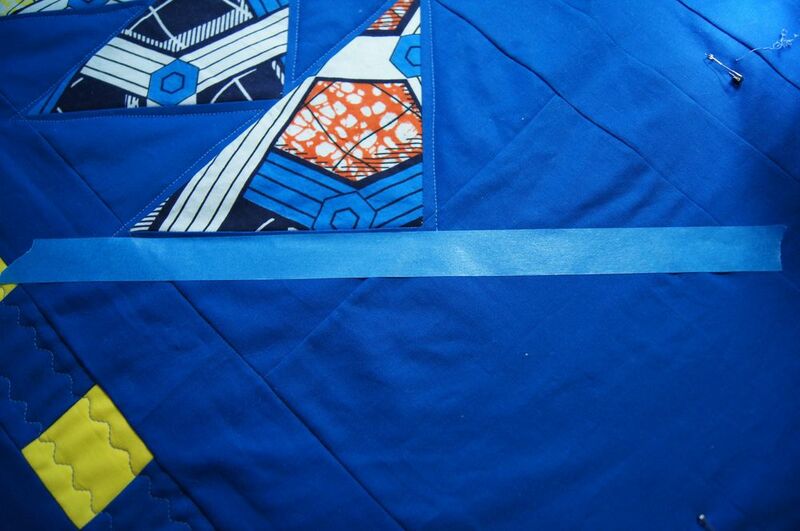 I'm currently working on the royal blue flying geese lap quilt. It's so modern, that quilting using straight lines using my walking foot felt like the best match for most of the quilt. 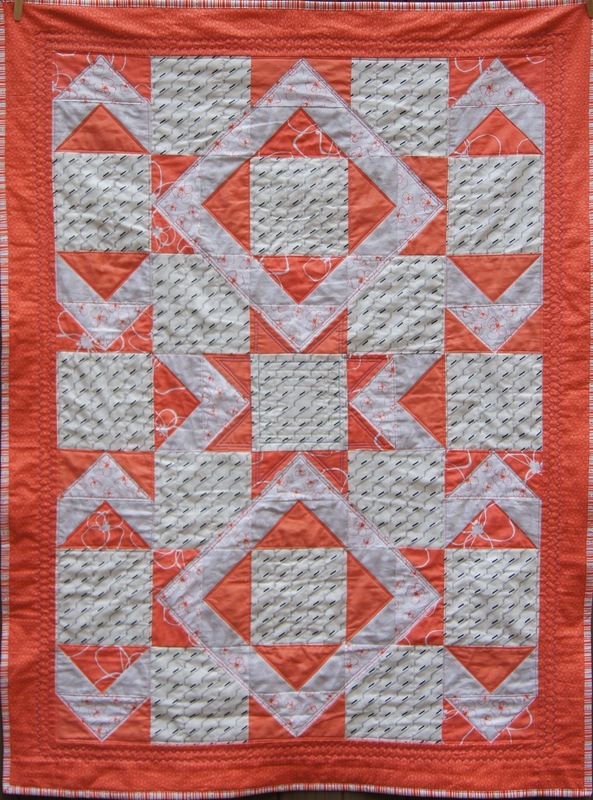 Here are some photos of my quilting. I like to use painter's tape for straight line quilting over areas with negative space, especially if I am quilting diagonally. It's easy to apply, it stays in place and can be used several times before it gets too linty to stick well, and it doesn't leave a glue residue when removed. The painter's tape in the photos is 1 inch wide. When I stitch, I keep the inner edge of my walking foot right at the edge of the painter's tape. It's easy to follow as I sew and it keeps me from sewing over the tape. If I have a stitch line that I want to follow but I want the distance between rows of stitching to be more than 1 inch, I use the metal guide bar on the walking foot. The bar runs right over the line of stitches. The line of stitching you get is only as good as the row of stitching you are following. Daydreaming isn't advised! 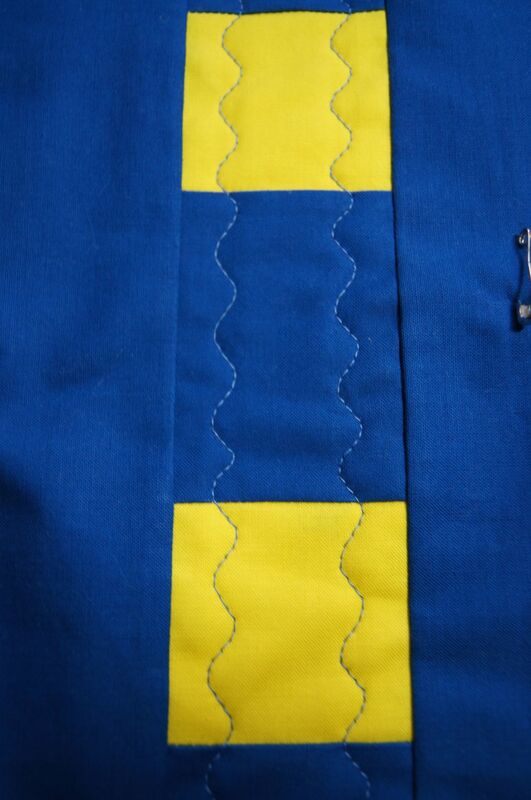 I used the wavy serpentine stitch on the blue and yellow strips in the quilt. 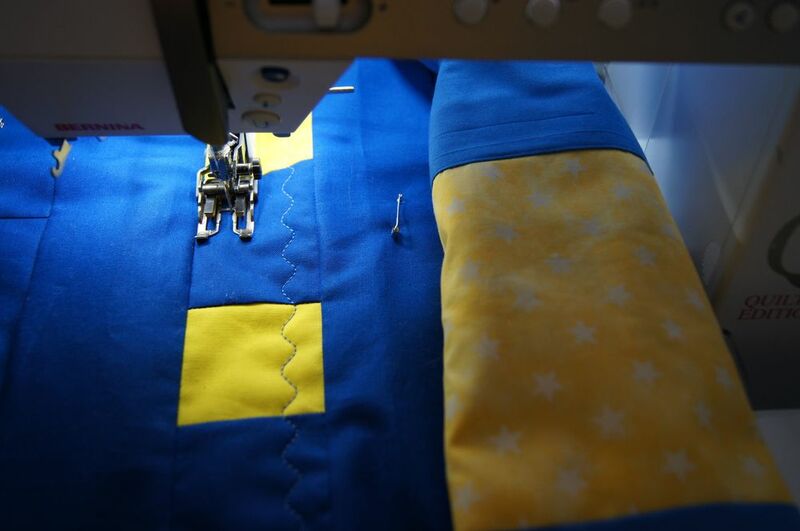 It's stitch #4 on my Bernina and I increase the length to 25 to get a wider wave and I use the walking foot. This quilt is almost done. 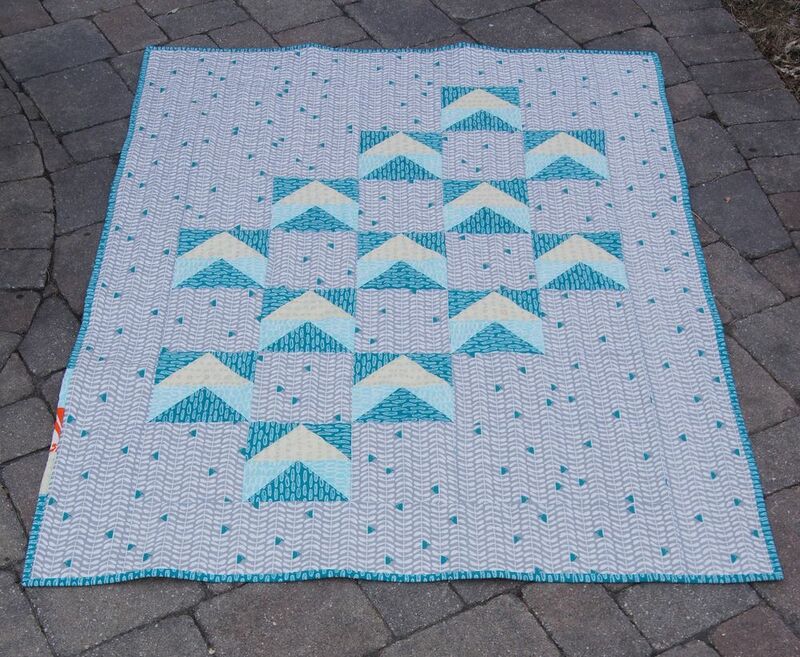 I'm still thinking about how to quilt the small flying geese blocks. Quilt number two has top, backing and batting all set to sandwich! Hopefully I'll get that done today. 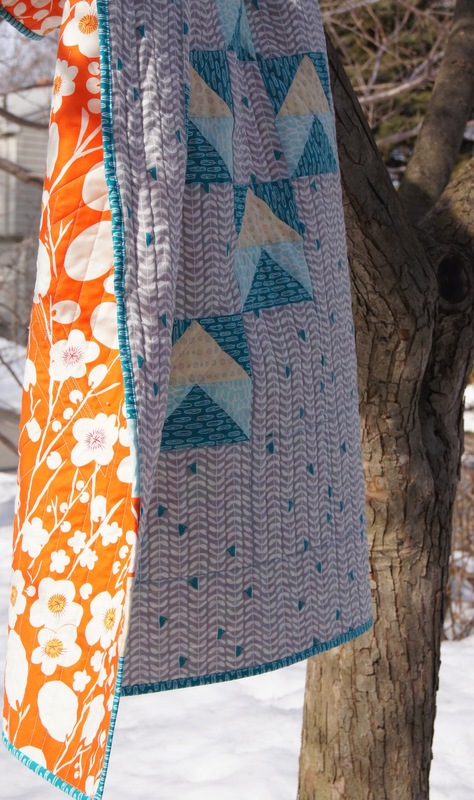 This flying geese quilt is something I started in the fall. There was no urgency to complete it so it went to the bottom of the pile when I started working on Christmas quilts. This past week, I had a sweet dog friend visiting for a few days. I'm going to call her my "Organizing Assistant Dog." Maggie isn't as young as she used to be and is a lot slower going up stairs. So I tried to arrange my activities to keep us on the first floor of the house as much as possible. My quilting room is on the second floor, so I looked around for projects to work on downstairs. Thanks to Maggie, I got some bins of scraps sorted, the dining room work area tidied up and I got this quilt top finished. Maggie, my Organizing Assistant Dog. You can see by her intent look that she is keeping me on task!! I already had the flying geese blocks done. Since all the precision sewing was completed, I was happy to use my light weight traveling sewing machine to sew the quilt together. The quilt is all improv. I had some ideas about the background but not a planned design. The yellow, blue and orange are colors in the African Wax fabrics. The yellow and orange are on the opposite side of the color wheel from the royal blue, making them bold accents. 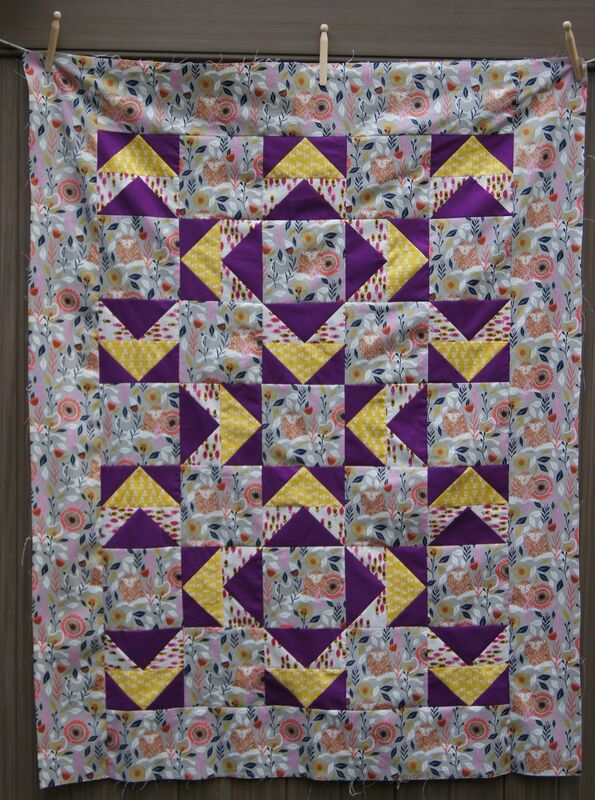 There is nothing subtle about this quilt but I really like design and the way it came together. At the moment, I'm partial to the Fox and Geese version. But that may be because it is the quilt I just completed. Or it maybe because this is the color scheme my mother, a professional interior designer who was a participant-in and devotee-to Mid-Century Modern, used in a house my father built in the early 1950s. The use of turquoise and yellow-green with accents of grey and navy seemed very avant guard to me at the time! I quilted Fox and Geese with the walking foot on my domestic sewing machine. Here are two details of the quilting. I used painter's tape to mark the first the row in the upside down V, top left in the photos. Then I used my line of stitching as my guide for the subsequent rows. When I reached the top of the triangle in the center of the bright green block, I had drifted to the left approximately 1/4 inch. 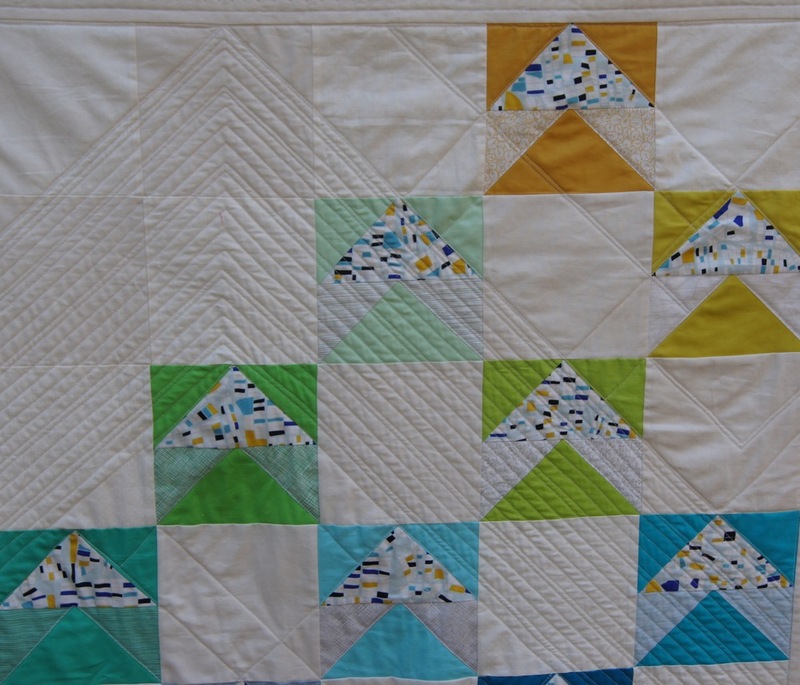 If I were doing it again, I would draw a line with dressmaker's chalk, or other removable marking, from the center of the top block to the point of the inner triangle in the green block. That would have given me a clear pivot point and my stitching could have stayed in alignment. That's how I marked my Modern Hexagon Quilt. Here's one last photo. This is my English Springer Spaniel, Tipper, showing off the text fabric on the back of the quilt. He likes to pose in my quilt photos!